PATROL BASE DETROIT, Afghanistan – There’s limited electricity and no plumbing here, but you won’t hear much complaining from the Marines who call this tiny outpost home. Patrol Base Detroit sits on the western side of volatile Trek Nawa, a relatively lawless region just east of Helmand province’s Marjah district. Marines here engaged in frequent firefights here until mid-October, when it appears the frigid temperatures at night led to the annual end of Afghanistan’s unofficial fighting season. They’re certainly still on the lookout for insurgent activity, but it appears the peak point has passed. Photographer Colin Kelly and I arrived this morning with elements of 1st Battalion, 1st Marines, out of Camp Pendleton, Calif. Much of the battalion’s 81mm mortar platoon and a team of 1/1’s scout snipers rolled in this morning in a variety of mine-resistant vehicles, bringing enough food and drinks to last several days. The movement was necessary because Marines don’t live at Detroit fulltime. The base is manned by a relatively good unit with the Afghan National Army, Marines said. The Afghan soldiers regularly tangle with the Taliban, and work with the scout snipers and mortar platoon to plan and execute missions. They’re improving dramatically with the 82mm mortars they wield, Marines say. The Afghans also share a strong camaraderie with the Marines. They sleep on separate sides of the base but engage in spirited games of volleyball during the day. Colin and I joined a handful of Marines in several of them this afternoon. The Afghans won all three games, mostly because the 6-foot-3 executive officer for the ANA tolay — a company-sized unit — is a master at spiking the ball. He also speaks English pretty well and loves joking around with the Marines. Earlier in the day, the Marines fired up the grill and cooked hot dogs, pork chops and other “Class-A” food they brought with them from nearby Combat Outpost Paserlay, headquarters to Weapons Company 1/1. 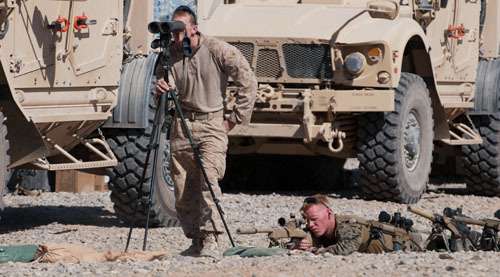 The scout snipers also took time to zero their weapons, a necessary job to keep them accurate, said Lance Cpl. Paul Maxinoski, a scout sniper with the unit. The colder weather changes the rifles’ zeros.